Google only announced and launched Chrome for iOS yesterday, but the browser has already found popularity on Apple's devices. 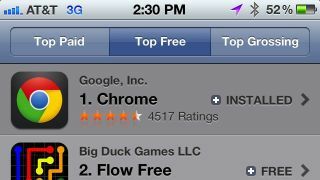 Chrome quickly jumped to be the app store's top downloaded free app on both iPhone and iPad, and doesn't show signs of letting go of that position. Chrome on iOS is a universal app, featuring unique gestures controls and screen formatting to best fit each device's screen. The biggest draw though is the ability to sync tabs, bookmarks, and passwords from your PC or notebook Chrome browser to your other devices - making it an extension of your web browsing on the go. Of course, the downside is that users are unable to set Chrome as the iPhone or iPad's default browser, with that role permanently held by Safari. There is a workaround though, as developer Jon Abrams created an iOS Safari bookmarklet to open pages in Chrome. Name the bookmark something simple like "Open in Chrome," and selecting it will open your current Safari page in Google's browser. It's hardly a perfect solution, but with Apple's firm grip on iOS default apps, it's the best solution we're likely to get.